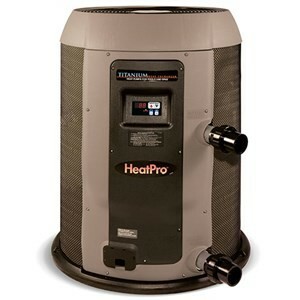 One of the most compact 110,000 BTU pool heaters on the market today, the overall form factor of this particular unit (and the reputation that the manufacturer has in this industry) are the main reasons that you should choose to go with this heat pump. You will definitely feel like you’ve made the right decision! While not nearly as oversized or as “technically advanced” looking at some of the other water heaters out there on the market today, this particular unit – the Hayward HP21104T Easy Temp Pool Heat Pump – has a smart design and is ridiculously simple to use and operate. I appreciate that Hayward took at least a little bit of time to design an enclosure that is going to protect the internals from outside elements while at the same time looking rather sharp, all while leaving the controls and the important fixtures easily accessible with zero obstructions whatsoever. The one thing that really knocks my socks off about this particular heat pump is the titanium heat exchangers that this system takes advantage of – a complete and total game changer in my book. While most pumps (just about any size) are manufactured with copper or stainless steel heat exchangers, this one is made with titanium to offer a dramatic increase in resistance to chemicals, additives, and even saltwater. This opens up a world of application opportunities that simply wouldn’t have been there with any other system and ensures that it lasts a long time. On the flipside, I’m not exactly overjoyed when I look at the actual price tag for this particular unit. Setting you back anywhere between $2,600 or so to $,5000 or more (depending on where you purchase this heat pump), you’re definitely going to have to shell out a bit of cash to take advantage of the benefits it brings to the table. I am consistently amazed at just how much a difference the titanium heat exchangers make when it comes to the overall efficiency of this unit. It seems like the manufacturer made a switch to titanium a couple of years ago (I think it happened in 2010 or so), and once they went away from copper they started to see some pretty dramatic increases in energy efficiency across the board. This allows this 110,000 BTU heater to easily bring water up to temperature in pools that are pretty large (we’re talking about 8,500 gallon pools or even bigger here) – all without completely blowing your budget apart when it comes time to order propane. The electronic (and completely customizable) thermostat allows you total control over the heating levels and speed at which this unit heats up your pool water, and the titanium core elements mentioned above make sure that the job gets done much faster than you ever would have thought possible before. We touched on in a little bit above, but the fact that this relatively small (BTU wise, anyways) unit is able to heat up larger pools consistently and at a speed unlike anything else really points to the heating capabilities of this particular propane heater. There is a reason why people out there feel like this heat pump is the cheapest way to heat a pool outside of (maybe) solar power. Good energy efficient, the ability to transfer the heat it generates to more than 80 gallons per minute at a clip with real consistency thanks to the titanium components, and with a reputation for reliability and durability that really can’t be topped, you’d have to be at least a little bit crazy to go with anything else. I sold a large PV system 3/29 to a client who wants to heat there pool. Currently the pool is heated with Gas. They want to heat the pool using the electricity from the Photovoltaic panels they bought. i added extra panels to there job to cover the cost of electricity to run the unit. the pool is 31 x 116. I was told 110000 BtU unit would do the job. Does it matter if the pool and hot tub is current gas. i assume running ur unit using electricity is not a problem. Any input u have is appreciated.